Valentine's Day is right around the corner and how cliche of me to post a red lip post, right? Ugh, I totally agree, but then again most of you (and me too #bandwagon) will probably end up sporting one on the day, sooooooooooo..... here we are. Now I personally feel that red lips don't have to be saved for special occasions, and I found some great options to wear on that day or any other for that matter. I love a good sheer or matte or blue based or orange based red lip as much as the next gal, and I have some great choices for all. 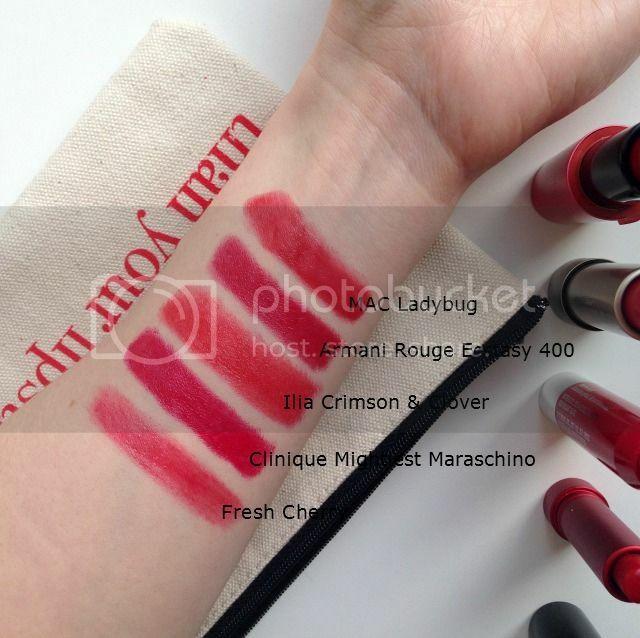 I know the below swatches are a tad slasher-movie-esque (ha!) but it's the only way to show the true color pay-off. I do it for the blog, I tell you. I do it for the blog. 1. Fresh Sugar Lip Treatment in Cherry - Ok, confession. I was a so-so fan of the original sugar lip treatments from years ago, but now that I have tried the tinted versions, I have to say I am head over heels. Such great colors with amazing moisturizing properties - I love wearing them alone or layered over another lipstick. I already have a back up of this one. That says everything. 2. Clinique Chubby Stick Intense in Mightiest Maraschino - The Chubby Stick craze never enthralled me to be honest, but after trying this new Intense version, I was blown away. The pigmentation is so intense and has a deep blue-based red undertone - simply gorgeous. And after wearing this and seeing how good it feels on my lips, I think I may give the original Chubby Sticks another look. 3. Ilia Tinted Lip Conditioner in Crimson & Clover - Tell me - have you ever seen a lip conditioner/lip balm with this much color and pay-off? Yeah, me either. It reads a lot more orange when it's on but it's great for a bright pop of color. 4. Armani Rouge Ecstasy in Shade 400 - Every lipstick collection needs a few classic reds - those lip colors that don't lean too orange, too blue or too pink. This Armani shade is that color for me - it falls right in the middle - I like to refer to it as the "Goldilocks of red lipsticks". 5. MAC Ladybug - This shade has been in my collection for years and is such a great sheer red that brightens up the face immediately. Throw on a sheer gold eye shadow on the eyes (love this one) and bronzer for the cheeks (I swear by this and this) and the look is fresh and glowing. 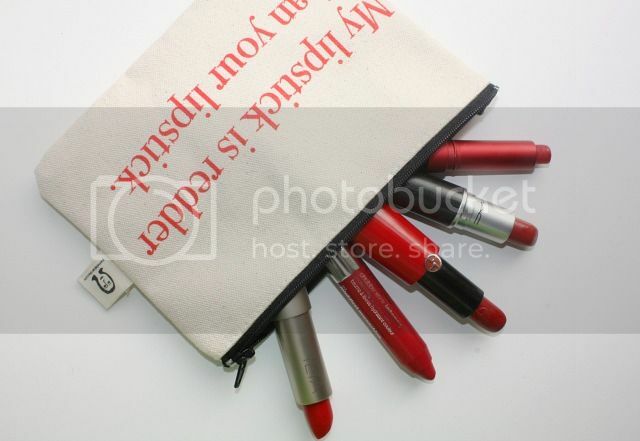 Purchase the makeup bag pictured above here. This is such a great post! I really like the way Mac Ladybug and Fresh Cherry look against your skin tone! And where did you get the makeup bag, I think it is too cute!